If you’re looking for easy ways to improve your knowledge and experience with this hot new social network, keep reading. The fast-paced development of Google+ has become a force to be reckoned with. Social media marketers and community managers will undoubtedly feel the pressure to keep up. In this post, I’ll share 20 tips and resources to help you keep learning about Google+ and ways to enhance your user experience. 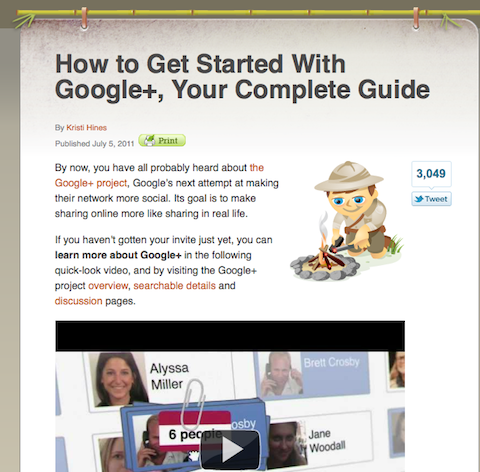 On July 5, SME blogger Kristi Hines published one of the most comprehensive How to Get Started guides for Google+. The post has literally helped thousands of people get started on the platform and if you weren’t an early adopter, it’s not too late! 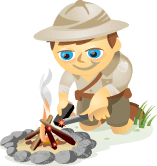 This post will provide you with the basics you need to know to create your profile, add connections, create circles, tweak settings, set notifications, see a stream of updates from your connections, give a +1 to your favorite posts, send updates, chat with friends, get a feed from Sparks and access Google+ on your mobile device. 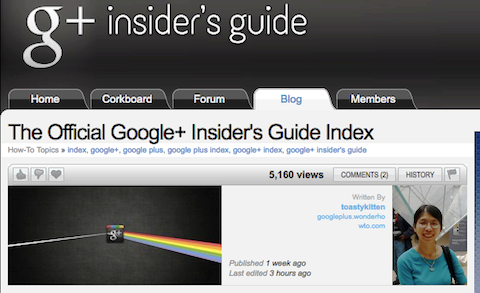 The essential, nuts-and-bolts guide to Google+. 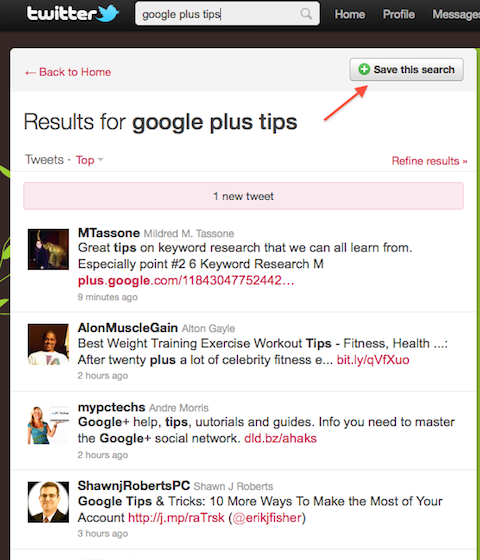 Engage in the conversation about Google+ by searching for “Google Plus tips” on Twitter. Too many to read all at once? No problem, you can save the search and return to it a later time. When you’re ready, pull down the “search” tab on your Twitter profile to access your saved search. Watch videos about Google+ on YouTube. 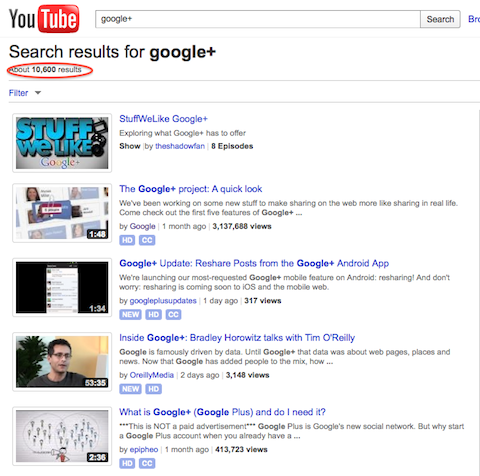 The search illustrated below, for example, found 10,600 results for videos about Google+. Recent videos posted include Is Google+ Killing Anonymity?, Google+Games, The Google+Song, Google+:The Potential of the Newest Social Network, Google+Invite links on Facebook. An abundance of Google+ videos can be found on YouTube. Utilize Google+ Help and learn about Google+ from the people who created it. For example, how to upload and share photos, how to hang out, circles and privacy and keep up with what’s new in Google+ with releases being made regularly. What do you want to learn about Google+? 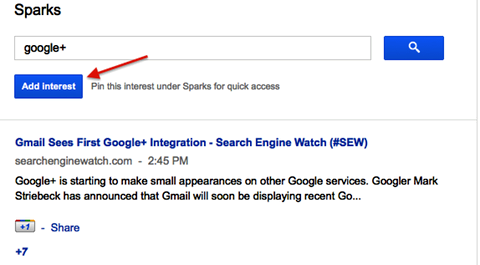 Set up a “Google+” Sparks on your Google+ account and see timely posts all about Google+. I found these interesting links on my “Google+” Spark. Sparks make it really easy to find what you’re looking for: How Google+ will succeed and why you’ll use it whether you want to or not, Google’s Bradley Horowitz Discusses State of Google+ with Tim O’Reilly, The Sekrit Circles of Google+. Interested in Google+? Add it to your Sparks for easy access. 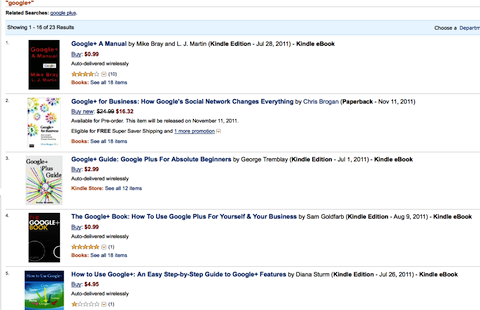 Keep up with newly released and forthcoming Google+ book titles on Amazon. You’ll be pleasantly surprised to see that there are already a number of books available on Kindle and some slated to be released in paperback and hardcover this fall. 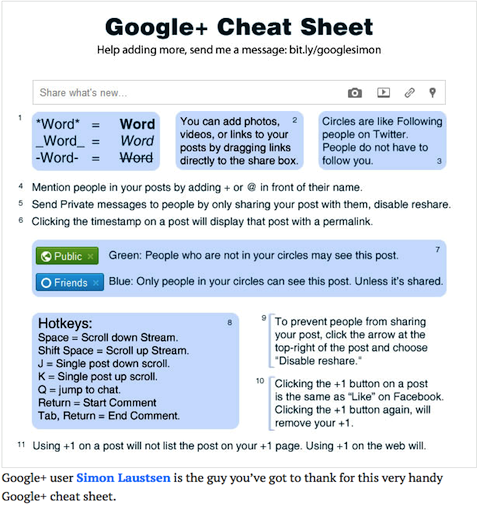 Print out and share the Google+ Cheat Sheet to help you format posts, utilize hotkeys, know all about mentioning people in your posts, sending private messages and accessing permalinks. A must-have resource for Google+ users. A resource for Google+ how-to's. 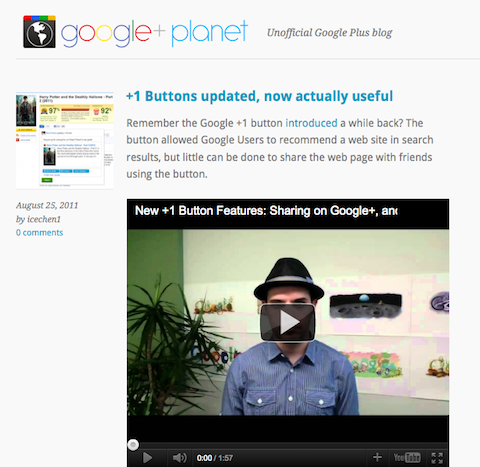 Read Google+Planet to stay on top of new features. Posts include info about the new +1 button features and +snippets, hangouts now integrate with YouTube and an announcement about games coming to Google+. Sign up to preview the latest updates to the Google+ platform before they are launched to the general public. If you’re going to be the go-to person in your business for Google+, this will be an important sign-up for you. Be among the first to preview Google+ updates. Stay abreast of Google+ Social Statistics. 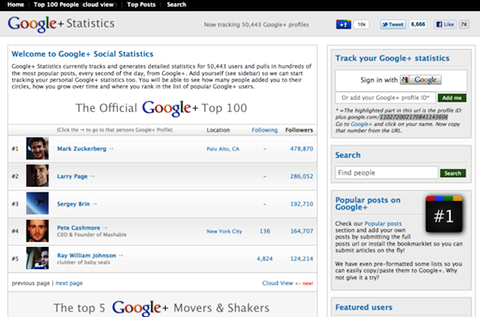 You can see who the top 100 Google+ people are and even track your own Google+ statistics, search for people on Google+ and see a list of the hottest Google+ posts from the past 24 hours. A plethora of detailed statistics on Google+ users. 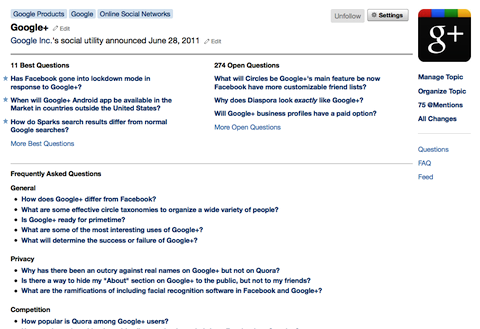 Read the Google+ Q & As on Quora, including 11 best questions, 277 open questions, frequently asked questions and tips for marketing on Google+. A great resource for curious Google+ users. Promote your Google+ account by putting the Google+ Widget on your blog or website. Install the Google+ Widget (user statistics are available within 48 hours). Connect Google+ to Facebook by adding the Facebook Stream to your Google+ profile. See your Facebook stream inside Google+. 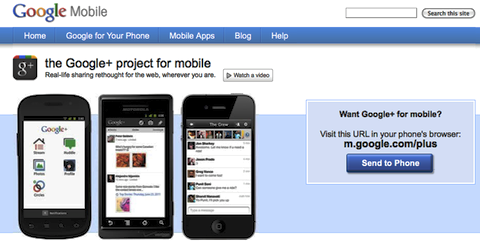 Get Google+ for Mobile. You can send a text message to your phone with a link and receive instructions on how to get started. Use Google+ on the go. View your timeline, URL shortening, photo sharing and more. 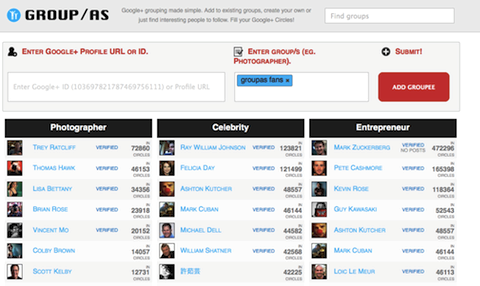 Find Google+ Groups and submit your profile to a group. For example, you can find a group of social media marketers or social media smarties. 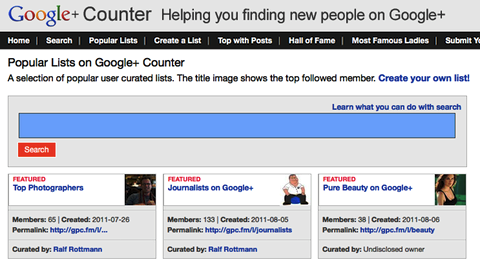 Find a selection of popular user-curated lists on Google+. You can search, find popular lists, create your own lists and see a hall of posters of some of the most followed Google+ members. Find new people on Google+. Make your Google+ URL short and friendly by shortening it on gplus.to. For example, before shortening my Google+ ID, it looked like this: http://plus.google.com/114279510179117392107/posts. After shortening, it appears this way: http://gplus.to/dhemley. Who will represent your business on Google+? Are you committed to incorporating Google+ into your social networking mix? What tips and resources can you add to this list? Share your thoughts in the comments box below.